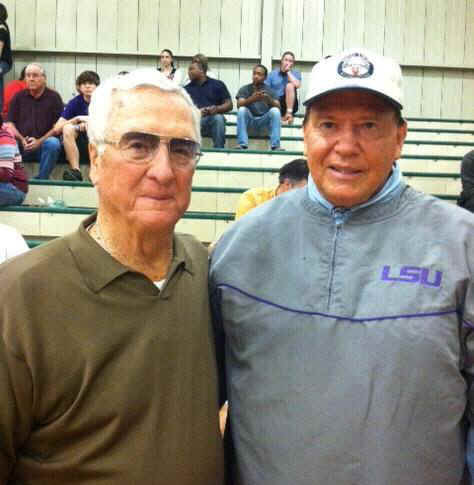 It was a great pleasure to be honored along with Coach Mel Didier at a recent Catholic High School basketball game. Mel Didier was my coach as a high school freshman. I was the only freshman in the district playing varsity ball. I recall Coach Didier as a great man and someone who I absolutely admired. I think at this stage in my career I needed someone who was supportive, encouraging and a strong role model. A lot of things that happened to me in my life were because of Coach Didier. He drilled and drilled and then drilled us some more to instill the team in fundamentals. Then I would go home and shoot until my Dad got home from work. In 1957 my senior year, we won the District Championship. By then Coach Didier had moved on to a college coaching position, but he stayed in touch with me with cards and letters. In the state play-off, I set a record double/double 35.5 points and 22.5 rebounds per game in the top classification, a records that has stood for 54 years. My 37points and 24 rebounds in the state semi-final game is still the best double/double in the LHSAAs top classification. This high school play set the foundation for a record setting college career. At Northwestern State University on December 12, 1961, I scored 44 points and had 18 rebounds against Kentucky Wesleyan. In that performance, I sank 18 of 21 field goal attempts (.857) which is a state college record for 20 attempts or more. It is not only a state record but also ranks as one of college basketballs all time best. Its an honor to be in the record book with the likes of Bob Pettit, Pete Maravich and Shaquille ONeal. Mel Didiers was a big part in helping me to achieve the successes I have had.